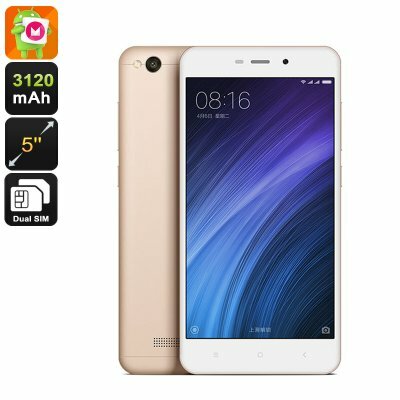 Successfully Added Xiaomi Redmi 4a Android Smartphone - Snapdragon 425 CPU, Dual-Band Wi-Fi, 4G, 2GB RAM, Android 6.0 (Champagne) to your Shopping Cart. The Xiaomi Redmi 4a is a sleek and stylish Chinese smartphone that runs on the trusted MIUI 8 operating system. Providing a fast and powerful user experience, this operating system has been based on Android 6.0 and comes packed with all the similar features Android users are familiar with. Additionally, the MIUI 8 OS comes along with its own set of customization options, allowing you to customize your phone exactly to your liking. Within its sleek frame, this Android phone packs a beautiful 5-Inch display that allows you to enjoy all your phone’s features to their absolute most. Watching movies, playing games, or using the latest Apps – the Xiaomi Redmi 4a lets you enjoy all in stunning beauty. Packing the Snapdragon 425 CPU that has been clocked at 1.4GHz; this Chinese smartphone is capable of dealing with the latest software without dropping a frame. Built for speed, this Quad-Core CPU lets you enjoy the latest games and most demanding applications, truly allowing you to take the most out of this beautiful smartphone. Added to that, this Xiaomi phone packs 2GB of RAM, letting you engage in the most demanding multitasking sessions out there without ever needing to worry about slowing down your device. With 16GB of internal memory and the possibility to add in another 128GB externally, you'll be assured to never run out of space to store all your favorite files and media alike. Supporting 4G connectivity and Dual-Band Wi-Fi, the Xiaomi Redmi 4a provides you with the fastest internet speeds out there no matter where you’re located. Stream online movies and download media in a blink of an eye, with its lightning fast data speeds a world of online fun and entertainment is just waiting to be explored. Along with its Adreno 308 graphics card, you’ll be able to take even more out of your mobile media experience as this phone will support the most graphically demanding games and applications while letting you enjoy them in absolutely stunning detail. With this Android smartphone at hand, you can be assured that not a single moment of boredom will lie ahead as you’ll always be able to enjoy your favorite media and games at any time of the day. With its sophisticated 13MP rear camera, this Chinese smartphone allows you to snap breathtaking images and footage. From now on not a single special moment in life will pass by uncaptured as, with this smartphone at hand, you’ll always be able to snap the perfect picture. Additionally, this Android phone also packs a 5MP front snapper, allowing you to engage in high-quality video calls with family or snap beautiful selfies while out with your friends. No matter where your next holiday or evening out will take you, with the Xiaomi Redmi 4a you’ll always be able to recall your memories by sharing the beautiful pictures snapped earlier on. The Xiaomi Redmi 4a comes with a 12 months warranty, brought to you by the leader in electronic devices as well as wholesale electronic gadgets..